Obesity is a medical condition in which excess body fat has accumulated to the extent that it could produce a negative adverse health effect. The various emerging and current investigational methods or techniques for the analysis and determination of total body fat composition and body fat percentage are the theoretical gold standard method of underwater weighing which has its foundation on Archimedes' principle, Bioelectrical Impedance Analysis (BIA), Whole-body Air Displacement Plethysmography (ADP), Dual-Energy X-ray Absorptiometry (DEXA), Near Infrared interactance (NIR), Body Average Density (BAD) Measurement, Ultrasound Sonography Technique (UST) and Anthropometric Measurements (AM) such as triceps skinfold thickness (TSF), Mid-upper arm circumference (MAC), Body Mass Index (BMI), Waist Circumference (WC), Waist-to-Hip Ratio (WHR), Waist-to-Stature ratio (WSR or WHtR), Waist-to-thigh ratio (WTR) and/or Obesity Determinant Indices (ODI). 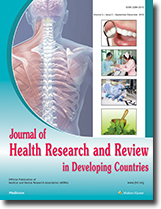 We the authors of this research work currently propose and recommend the Obesity Determinant Indices (ODI) as novel anthropometric measurements that will serve as a more reliable predictor and accurate indicator of cardiovascular disease risk factors, including body fat redistribution, hypertension, dyslipidemia, stroke, ischemic heart diseases, heart failure, chronic kidney disease, sleep apnea and type 2 diabetes mellitus in obese patients. Furthermore, We also jointly propose and recommend the diagnostic and interventional criteria for obesity treatment which are the First Criteria (Criteria-I) and Second Criteria (Criteria-II). 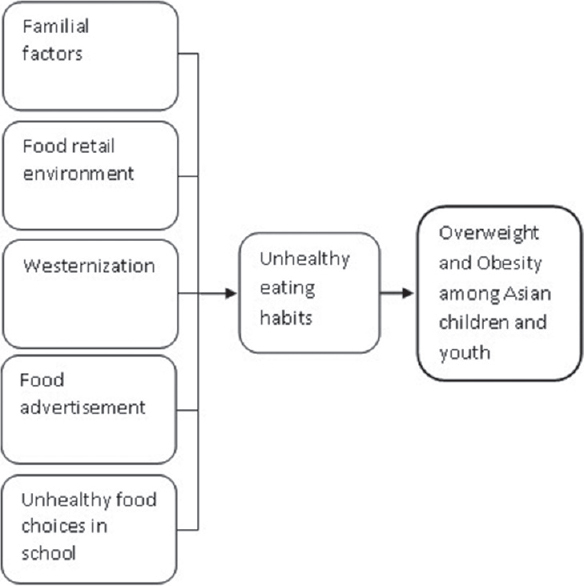 These criteria take into consideration the presence of an individual body mass index (BMI), presence of at least one waist circumference (WC) dependent parameters (such as WC or WHR or WHtR or WTR or any of the ODI) that fall into the obesity reference range, and/or presence of at least one obesity-related comorbid conditions/risk factors such as hypertension, type 2 diabetes mellitus, dyslipidemia, osteoarthritis, rheumatoid arthritis, polycystic ovarian syndrome, heart failure, ischemic heart diseases, sleep apnea, depression disorders, anorexia nervosa, bulimia nervosa or any other obesity-associated neuropsychiatric disorders. In conclusion, initiation of appropriate treatment in the form of High-Intensity Lifestyle Interventions alone or a combination of pharmacotherapy with Low-to-Moderate-Intensity Lifestyle Interventions should be commenced for any patient that meet these stipulated criteria guidelines. Background: Children malnutrition is one of the major public health-related concerns in all over the world, especially in developing countries like Bangladesh. Several socioeconomic and demographic factors are responsible for this situation. Aims: The purpose of this research was to identify the contributing factors of malnutrition in Tangail district using primary data collected from rural Tangail. Materials and Methods: The sample was collected using the cluster sampling techniques. Villages were considered as a cluster, and the sample from cluster are selected using probability proportional to size method. In our study, we have categorized the child nutritional status as, “severely malnourished,” “moderately malnourished,” and “nourished” based on Weight-for-age z-score. Bivariate analysis was conducted by examining the gamma measurement for ordinal variables and to check the association between child nutrition status and selected individual variables; we have used the contingency table and Chi-square test. Statistical Analysis: Both univariate, bivariate, and multivariate analysis was conducted to meet the objectives of the study. The proportional odds model was selected to understand the stable effects of covariates influencing the child malnutrition. Results: Bivariate analysis shows significant (P < 0.01) associations for almost all of the selected covariates and the multivariate analysis describes the relationship between education and occupation, mother's (body mass index were found highly statistically significant (P < 0.01) and for child malnutrition. Conclusions: The findings of this study suggest the necessity of improving the mother's education level, nutritional status, and the job facilities for women to achieve the optimum nutrition for children under 5 years of age. Background: Urinary tract infections (UTIs) attributed to the use of an indwelling catheter is one of the most common infections acquired by patients in health-care facilities. This infection is associated with varied microbiological etiology. This along with existing underlying condition increases hospitalization, medication, morbidity, and also adds to the financial burden. Aims and Objectives: The aim of the study was to provide a baseline information in the context of incidence of catheter-associated UTI (CAUTI), to identify the associated microbial, and to determine their susceptibility pattern to commonly used antimicrobial agents for prophylactic and empiric therapy in this group of patients. Materials and Methods: This prospective study was done on nonrepetitive urine samples from catheterized patients. Semi-quantitative bacterial culture was performed, and isolates were identified by standard biochemical tests. Antimicrobial sensitivity tests were carried out by disc diffusion technique using Mueller-Hinton Agar as recommended by Clinical Laboratory Standard Institute. Results: Significant bacteriuria was observed among 17/161 (10.55%) urine samples. Among bacterial isolates, Gram-negative bacilli predominates. 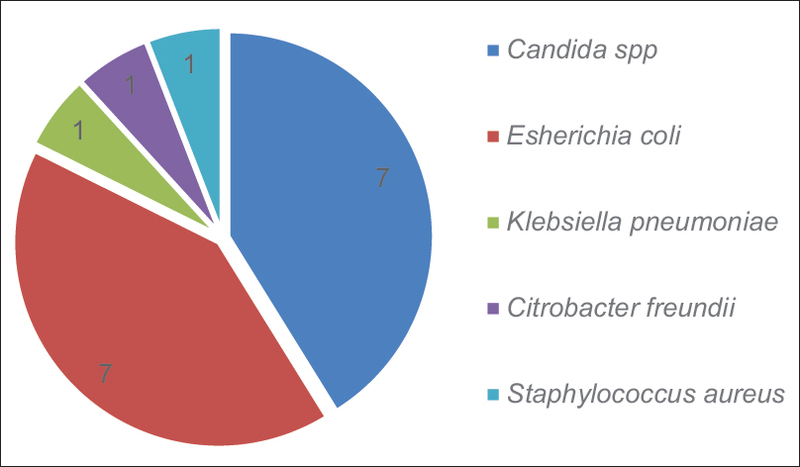 Escherichia coli 7/17 (41.17%) being the most common isolate. The incidence of UTI/1000 catheter days and urinary catheter utilization ratio observed in our study was 4.41 and 18.05, 0.673 and 0.066 for intensive care unit and wards, respectively. Conclusion: Burden of CAUTIs is vast with regards to incidence, patient outcomes, cost, reimbursement, and suffering. Our study underscores the pressing need for the development of antimicrobial urinary catheters and also we strove to minimize the effect of exogenous factors on the incidences of CAUTI and regarding the development of protocols and checklists on the insertion and management of indwelling urinary catheters based on the UTI prevention guideline. Background: Fetal foot length (FFL) is a biometric parameter that has been established for estimating the gestational age (GA). Accurate knowledge of fetal weight (FW) and GA assist Clinicians in the evaluation of fetal growth and predict neonatal outcomes. Aims: This study aims to predict the estimated FW and GA using the FFL in 26–40 weeks' gestation on antenatal ultrasound. Materials and Methods: In a retrospective study, we investigated the fetal measurements of FFL, femoral length (FL), and estimated FW in 100 pregnant women at 26–16 weeks' gestation who attended routine antenatal care. The fetal measurements were examined about the foot length. Results: The foot length was not a significance parameter to determine fetal gender (P = 0.6). There was no correlation of FFL with maternal socioeconomic status, parity, fetal gender, and maternal body mass index, P = 0.26, 0.84, 0.67, and 0.26, respectively. The FFL, FL, and estimated FW were strongly and linearly correlated with GA. 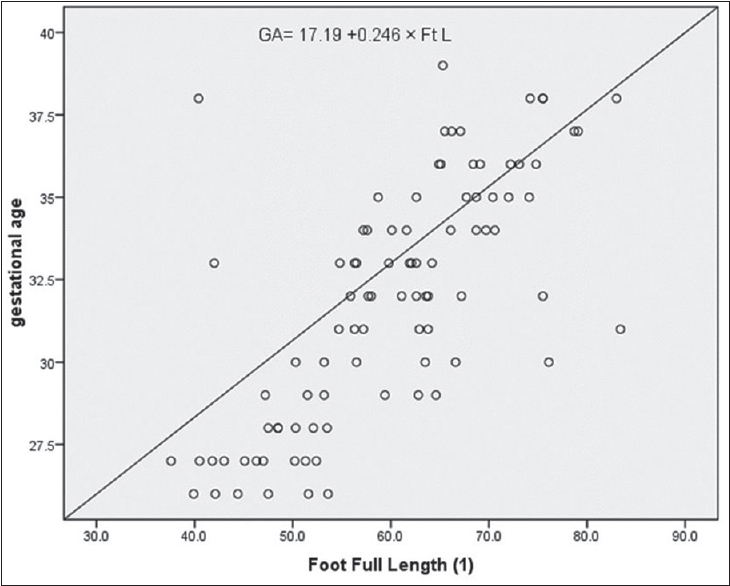 The combination of FL, foot length, and estimated FW provide an accurate estimation of GA with minimum (standard error [SE] = 1.75). The combination of FL and foot length provide an accurate prediction of FW with SE of 320.52. The foot length and FL revealed similar values of SEs in estimated FW (R2 = 0.85) for each. Conclusions: The FFL is linearly correlated with GA, FW, and FL. It is an accurate parameter to assess the GA and reliable for predicting the estimated FW. This is useful for assessing fetal growth and skeletal dysplasia. Background: Carbapenem-resistant Enterobacteriaceae (CRE) is a serious global public health threat. Antibiotic overuse, improper sanitation and unhygienic practices lead to large scale carriage and rapid spread. Biofilm formation by these strains can lead to far reaching consequences. Material and Method: This is a prospective hospital based study planned for a period of 3 months including all patients admitted to 14 bedded Trauma ICU of a tertiary care hospital in Rajasthan. Rectal swabs were collected from admitted patients and carriage of carbapenem resistant enterobacteriaceae looked for as per CDC guidelines. Screening of the Enterobacteriaceae colonies for carbapenemase production was done by Modified Hodge test. Carbapenem-resistant isolates were also tested for Metallobetalactamase production by phenotypic disc confirmatory test. Biofilm formation testing was done by Tissue culture plate method. Results: A total of 73 patients were screened and 27 CRE isolates were obtained, carriage rate being 37%. A high level of resistance was seen to aminoglycosides, fluoroquinolones and cephalosporins. 100% sensitivity was however seen to Colistin, Tigecycline and Fosfomycin. 5 out of 27 strains showed a positive MHT test. Metallo beta lactamase (MBL) production was seen in 21/25 strains as tested by meropenem and meropenem-edta discs. Of the 27 CRE isolates tested for biofilm production, 13 (48.15%) were found positive. Conclusion: The current study finds out the prevalence of CRE carriage and the biofilm forming potential of these strains among critically ill patients and stresses upon urgent need for stringent infection control measures. Aim: Incidents of vandalism on doctors is increasing by alarming rate. It has been observed in all types of government and private set ups. This trend is observed pan India as well as globally. Methods: A descriptive analysis of reported data on vandalism on doctors from the Google search engine, all national and local news websites of the last 11 years from January 2006 to May 2017. Results: The number of cases reported was counted yearly which showed a remarkable increase in crime against doctors. Majority of the cases have been reported in media from Delhi and Maharashtra in the last 11 years. Out of 100 cases reported majority were witnessed in 2015 and 2016 (17 each) and followed by 2017 (14). Majority of the males suffered grievous injury (52.1%); this distribution was statistically significant (P = 0.001). The night shift contributed higher proportion of grievous injuries (52.9%) (P = 0.003). Conclusion: The source of this intolerance toward health-care providers stems from unlimited expectation (magic cure) from doctors on the one hand and unjustified expectation and limited health education of patients and their caregivers (attendants and bystanders) led them to believe that medical science has a curative solution for all the health problems even in the resource-rich settings. Primary fallopian tube carcinoma is an extremely uncommon tumor of female genital tract origin with the incidence of 0.1%–1.8% of all genital malignancies. Due to its nonspecific symptomatology and rarity of this neoplasm, correct preoperative diagnosis is made only in 4% of the cases and is usually first recognized by pathologist. Our case was a 39-year-old patient who presented with intermittent vaginal bleeding, lower abdominal pain, and pelvic mass. On physical examination, lower abdominal tenderness was found. Ultrasound examination revealed bilateral hydrosalpinx. 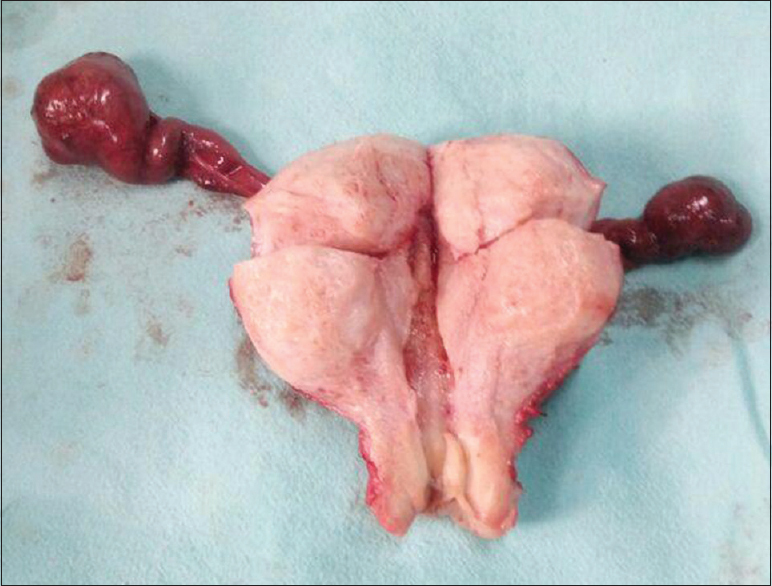 The patient underwent total abdominal hysterectomy with bilateral salpingo-oophorectomy. Histopathological examination confirmed features of papillary serous adenocarcinoma of the left fallopian tube. The patient was referred to oncologist for chemotherapy. Six months following initial surgery, the patient is in good condition. This case is being reported due to the scarcity of data published from the Indian population and rarity of this neoplasm.